For years I have been working using this model and it has served me well. 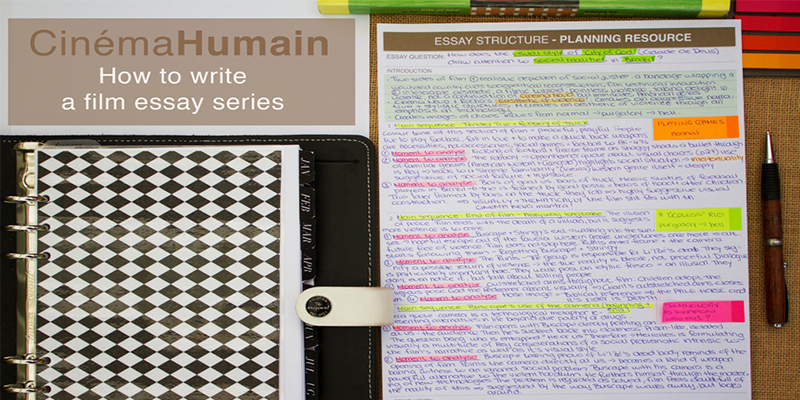 After having done my research, having watched the film many times and having made a great deal of notes, I usually move on to develop a two-page plan before even thinking about the specific structure of the essay. When it comes to structuring it is important to realise that this isn’t the actual essay yet, which means, you do not have to have everything written down for you to know how to approach the writing. The structure of your essay is the path you will follow in order to logically move from argument to argument during the actual writing process. Therefore, your structure needs to be as short as possible so that you can have an instant overview of what you are going to say. Keeping it to a single page usually works for me. Additionally, as they say, all good things come in threes, which is why I tend to only focus on three specific points in relation to the essay question. More than this usually means I am not focused enough, which results in an essay that does not go into enough analytical detail. Finally, these three overarching arguments are clearly bookended by an introduction and a conclusion – the length of which greatly depends on the word limit of your assignment. First of all, it is important to always keep reminding yourself of the essay question. So, including it at the top of your document will help you through the process. Again, as you can see in the image, I have highlighted the key question aspects that are important to keep in mind. Also, try and use these words throughout the essay as a subtle hint to the reader that you are constantly aware of what is being asked of you to do. The ‘Playing Games’ section of the case study is focused on one specific sequence in the film, notably the robbery of the gas truck by the Tender Trio. Every argument I make and every point I raise in relation to the social importance of the film is built on my engagement with this sequence. This however does not mean I cannot refer to other sections in the film. In fact, I think it is very important to refer to other moments as well, since it illustrates ones ability to view a sequence within the context of the whole film and therefore would make the essay stronger. But make sure to keep coming back to your chosen sequence. I find that the second point in an essay is often the longest one with the most significance in relation to the question. In our example this turned out to be the case as well. Looking at the idea of the ‘Godless Rio’, this section of the essay considers the closing moments of the film when Buscapé and Stringy leaves the favela while the Runts walk back into it. Technically, it is a complicated shot to execute because it involves many characters, hitting marks while co-ordinating specific movements of both the actors and the camera. It therefore seems like an important moment to look at in closer detail. The moments that I chose to focus on stem from this extended shot. As highlighted above, although I mention other moments in the film alongside this sequence, the logical flow of my thought-process is supported and enhanced by constantly returning to the Runts at the end of the film. The final point in our City of God example relates to the question in a very particular way, because it considers the self-conscious use of the camera by the filmmaker. Not only does the director use the camera to shoot in a very particular way, but he also includes a camera in the story itself. What is more, he often also turns that camera (i.e. the camera within the narrative) towards us, the viewers. This raises some interesting questions in relation to who is filming and who is being filmed. Moreover, in terms of the visual style of the film this is particularly significant and quite impossible to ignore. The moments I have chosen to focus on involve the way in which Buscapé handles the camera at the beginning and end of the film. After the three points have been made, it is important to return to the question again so as to clarify your stance towards the film on the one hand, and the question itself on the other. Useful to always keep in mind, is that you are not writing only for yourself. This essay will be read and marked by someone. So, clarity at the end of your essay that you have indeed addressed the question would be a clever move. During the structuring phase, I often include and then highlight words related to the question. This reminds one to bring the essay to a logical conclusion in a way that makes it easy for the reader to see one remains focused. Importantly, doing this suggests to the reader that ones final remarks are founded on close textual analysis derived from the question and supported by the examples chosen. I hope you have found this guide useful and that it will help you to write the best essay you can. Above I include links to where you can download both the Planning Resource and the Structuring Resource. I would really appreciate your support. The third button will take you to the completed essay, which is entirely developed by using these two resources. Finally, please do let me know if this is helpful to you. Also, if you are struggling in a specific area of your own process and want to know how I would approach it, do send me a message or leave a comment below. I would love to help where I can. How does the visual style of ‘City of God’ draw attention to social realities in Brazil? Are you interested in human rights and environmental cinema? Join the community and add your voice!